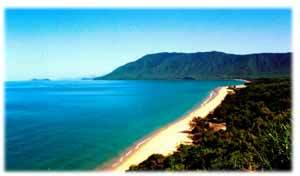 Port Douglas is only about an hour from Cairns by road, and it is a very scenic drive. You have choice of hiring a car in Cairns, or to take one of the buses that also pick up from Cairns airport, this is an international airport so you can arrive here on both domestic and international flights from overseas. Unless you live in north Queensland you will have to fly to the nearest international airport Cairns first..
BTS tours offers transfers from Cairns and Airport to Port Douglas, book your transfer online with instant confirmation. If you are already in Australia then go to our page Cheap Domestic Flights in Australia for a good choice in cheap domestic airfares to Cairns. If you are still in your home country then you will need to get an international flight to Cairns, but be aware that although Cairns is an international airport, not too many airlines go straight in to Cairns, you will usually have to fly via Brisbane or Sydney. ZUJI is an online travel agent with offices throughout the Asia Pacific region, offering you a choice of more than 400 airlines and 60,000 hotels, as well as car hire and travel insurance. Feel more comfortable to book your airfares to Cairns online with a travel business from your own country that you know and trust? There is a wide choice of car rental companies where you can book your car or campervan online to be assured of a car when you fly in at Cairns airport, and most offer one way rentals between major cities. Nothing beats the freedom of having your own car to explore and stop when and where you want. Budget Car Hire needs little introduction, the name says it all: car hire at Budget Prices with a car hire company with an international reputation, and this sites makes it even easier to find yourself a cheap hire car, or anything else with wheels: trucks,buses, campervans, utes, four wheel drives etc. When you book with the above websites you are sure you deal with reputable car rental companies, without wanting to discredit the smaller local companies, we have received some not overly positive customer reviews on Cairns Older Car Hire. Several bus companies run door to door services from your Cairns accommodation or airport to your Port Douglas acccommodation, they usually run every hour or so but they tend to change their timetable from time to time so to play it safe email or phone them for up to date departure times, their websites are not always up to date. While staying in Port Douglas you will probably head up to Cape Tribulation in the Daintree for a few days, these two bus services do a door to door service from Port Douglas to your accommodation in Cape Tribulation. BTS tours offers a more convenient way to book your transfer online with instant confirmation. Sunpalm Transport operate scheduled coach and bus transfer services between Cairns, Port Douglas, Daintree, Port Douglas and Cooktown, they will transfer you door to door to your accommodation in Port Douglas. Daintree Air operates flights between Cairns, Port Douglas and Cow Bay, the nearest air strip to Cape Tribulation. There are two local bus services that do the rounds, and there is a taxi rank on Macrossan Street, the main street of the town, or phone them on 4099 5345. The bicycle shop on this street also rents out bicycles. There is also a local Harley Davidson tour operator if you want to get around town in style.